At TD Wealth, we understand that making decisions that will affect your life is a deeply personal experience. We also appreciate the key role that growing and preserving your wealth plays in helping you enjoy the life you want to lead. Whether you're just building your career or shifting into retirement, looking for help in transferring your wealth or transitioning your business, we have the breadth of expertise to design a plan that will help make you more confident in your decisions, and more focused on your future. We look forward to working alongside you and your family to help you achieve your goals. 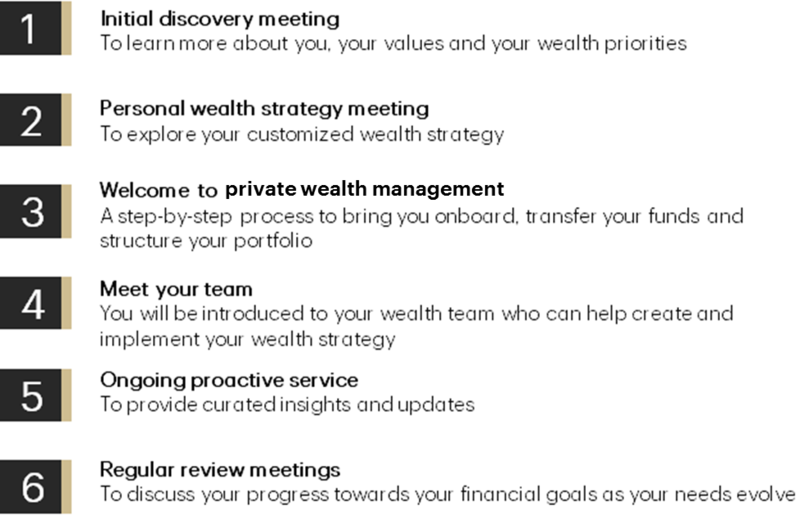 Wealth Management is a complicated process with an infinite number of moving parts. 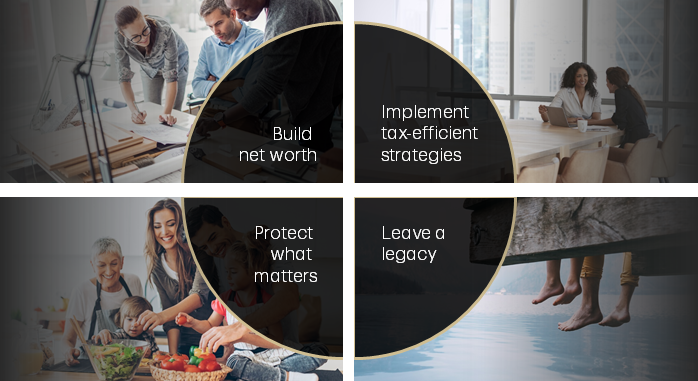 Our focus is on the four pillars of wealth: building net worth, implementing tax-efficient strategies, protecting what matters most to you and leaving the legacy you desire. Building your net worth - we know how important it is to build your wealth so you can enjoy life’s priorities and achieve your vision for the future. Working together we can develop innovative strategies to help grow your net worth by identifying which credit strategies and investment solutions match your current lifestyle and needs. Our team of professionals can work with you to develop an effective plan to help you achieve that vision. Implementing tax-efficient strategies - you've worked hard to accumulate your wealth and we want to help you to make the most of it. Working closely with you and your tax advisors, we'll create an integrated wealth strategy that will help structure your investment portfolio to help reduce tax exposure while keeping income available as and when you need it. Protecting what matters most to you - life is filled with uncertainty and that's why we're committed to delivering advice and solutions to help protect the things you value at every life stage. Whether through comprehensive risk strategies or connecting you with a specialist in trusts, estates and other risk mitigation products, we've got the expertise to create a comprehensive plan that's right for you. Preparing for the legacy you want to leave - you are the architect of your legacy and we can help you with the blueprint. We'll collaborate with you to identify your top priorities, from estate planning and trusts to gifting and philanthropy. Our goal? To help you optimize the transfer of wealth to those who matter most to you. Imagine having someone who provides you with tailored and hand-selected access to a variety of professionals and specialized services. Someone who responds with thoughtful insights and solutions that consider tax implications, family dynamics, and other priorities. A steward, if you will, who leaves nothing to chance. Someone with an intricate understanding of your needs and objectives. Entrusting us with your financial affairs is a responsibility we don't take lightly. Our investment professionals ensure your wealth strategy is aligned to your life stages. We will connect you with an Investment Advisor that is right for you – they will deliver well-planned, personalized solutions that simplify the complexities of wealth and ensure the right specialists are around you each step of the way. Through TD Wealth Private Banking we provide banking at your convenience - delivering proactive bespoke banking and credit solutions. Your dedicated Private Banker is ready to service your unique, and potentially more complex, needs. Enjoy priority credit approvals and expedited cross-border banking. By engaging TD specialists, we can help you take steps today to transfer, preserve and manage your wealth for future generations. It's been a lifetime in the making. So now you deserve nothing less than specialized services to help you preserve your wealth and leave a meaningful legacy. From succession planning to gifting and philanthropy, we'll help you transfer your wealth to those that matter most to you. You'll have access to knowledgeable team of planning specialists who can help you with strategies to grow and transition your wealth. TD specialists provide wealth planning services, tax mitigation strategies, estate planning and business succession planning. TD specialists will work with families and their foundations to invest in a way that reflects their values to maximize social impact. We provide high-quality investment management services and have expertise in managing foundation funds. Our advisory services act as a resource to keep foundations informed about trends in the charitable landscape. To act for another, one must know the other as they know themselves. Starting with a blank page, an inquisitive mind and great deal of empathy, we ask numerous questions to reveal what is truly most important to you, your family and business. Each person's needs are unique and our goal is to offer you the relevant, customized wealth advice you deserve. We can only do that by getting to the heart of what matters most to you. That's why we take a unique approach to understanding you, your family and your values. We want to discover everything about you, all the things in your life which make up you and your financial DNA. The innovative discovery tool we use will take you through some behaviour questions so you can better know yourself and how you really make decisions. And when it's all done, a diagnostic using behavioural finance theory will take all that information and tell us how you often behave, how we can work best with you and what the next steps are in creating your strategy - prioritized by what matters to you. A wealth strategy which manages the important things like your retirement, your kid's education, your family cottage - not just your money. As Vice President, Branch Manager and Investment Advisor at TD Wealth Private Investment Advice, Darren has management responsibilities for Private Investment Advice in Prince Edward Island. He has been providing comprehensive wealth management advice and solutions to individuals, institutions, small business owners and their families since 1996. Darren is committed to providing exceptional client service, tailoring investment and planning strategies to suit individual needs. He works with clients to create a customized, personal wealth and retirement plan to build and protect their financial future. The cornerstone of his business is a close relationship with each client, based on trust, communication and a detailed understanding of needs. By working in partnership with the team of specialists within TD Bank Group, Darren addresses the full scope of investment, wealth and retirement needs, including wealth protection, estate planning, trust services and charitable giving strategies. Active in the island community, he currently sits as a member of the board of directors of the Schizophrenia Society of Prince Edward Island as well as a national board member and Director of Marketing/Fund Development with the Schizophrenia Society of Canada. Please call directly at 902-629-7021 to see if you could benefit from Darren's unique approach to wealth management!